We are delighted to announce the appointment of Mr Paul Bambrough as Head of The Purcell School from 1st September 2018. He will take the new job title of Principal. Mr Bambrough is currently Vice-Principal at the Royal Birmingham Conservatoire where he has responsibility for all aspects of the day-to-day running of the institution, the artistic programme, curriculum and collaborative partnerships. He is a devoted teacher and also teaches within the Department of Vocal and Operatic Studies as well as contributing to undergraduate programmes in Pedagogy, the postgraduate Lecture Recital module, and the Orchestral Conducting course. 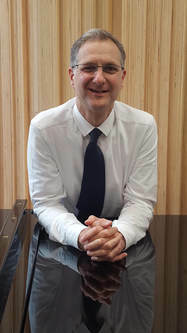 Described by a former Secretary of State for Education as ‘one of the most inspiring teachers’, Paul Bambrough has gained a national reputation for his work in state music education. Whilst Director of Music at the Sixth Form College Farnborough, his passionate dedication to excellence led to the creation of the largest A Level Music Department in the country comprising some 500 students actively engaged on courses and enrichment activities. Paul has also worked as an inspector in Post-16 music institutions, and has been sought as a consultant in many colleges around the country. He believes in the transformational power of music and seeks to communicate the great joy of music to all those with whom he works. As a tenor, Paul has performed at most of the UK’s foremost concert halls and cathedrals. He is a harpsichordist, organist and pianist and has had the good fortune to work as a Repetiteur with some of the world’s finest singers. Away from music he enjoys the countryside, architecture and maintains a (largely) enthusiastic fitness routine.